Check out this complimentary customized plastic cup on offer to Soltan Suncreen Customers. 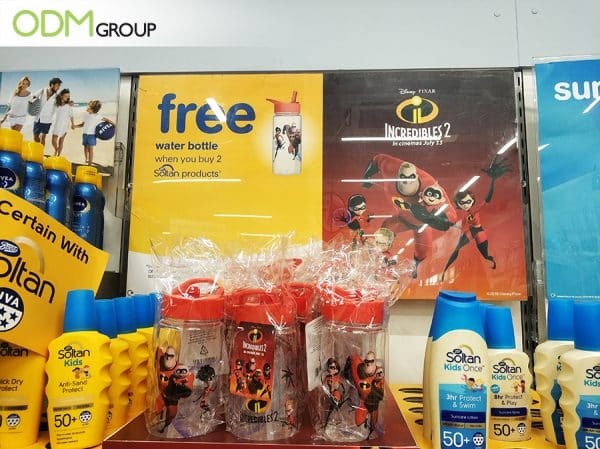 They have strengthened their brand exposure by co-branding with Pixar and their new release of the Incredibles 2. 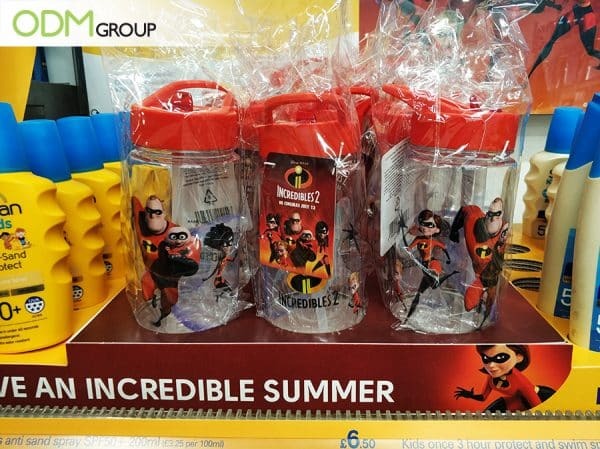 ‘Have an incredible summer’ is a great catch phrase for this. A seasonal gift with purchase can be a game changer when trying to make your company stand out on the shelf. Customers who buy 2 bottles of Soltan Kids sunscreen lotion will be treated to the customized plastic cup. The cup is great to fill up with water and take to the beach on a hot day. Labelled in big words, the custom retail sign says ‘free’ to instantly entice customers. Custom retail sign ideas are consequently important to get right as this will be the first interaction the customer has with your product and will be crucial to differentiate your brand from your competitor companies. Indeed, a gift with purchase will make customers think they are getting more for their money and therefore will increase sales and customer loyalty. The cups themselves feature the Incredibles characters and the colour scheme and use of red gives instant recognition of the movie. It is perfect for kids of all ages. As an extremely popular film, is bound to make rapidly sunscreen sell off the shelves. They have a built in straw with a lid to prevent spillage. This is certainly a great cup design. Health Awareness: Out in the sun and applying sunscreen? What better complimentary gift than a bottle to keep your kids hydrated too! We love a gift that is both appealing and practical. This Customized Plastic Cup does just that! Custom Water Bottles are thus a win win! Customer Loyalty: Give back! Happy customers will maintain loyalty to your brand. Marketing gifts are extremely useful in helping to promote your brand. People would feel that they received more than what they paid for, thus they are more willing to purchase your items. Drives Long Term Sales: Because of that good feeling customers associate with your brand, they would generally favor your brand over others. As a result, your brand will see an increase in profits and sales. Effective Advertising: If another customer spots your product with the collectible freebie promotion and like it, customers will tell other potential customers through the word of mouth technique, therefore increasing your brand awareness. Collector’s Item: The plastic cup is an ideal gift for fans who are specifically looking for this collectible merchandise. Limited edition makes it more appealing to collectors. This means the retail store will benefit from the patronage of movie fans. Perfect for Seasonal Campaigns: The branded drink bottle is ideal for summer promotions as well as sporting events, music festivals, and charity promotions as participants and attendees will have to remain hydrated throughout the event. 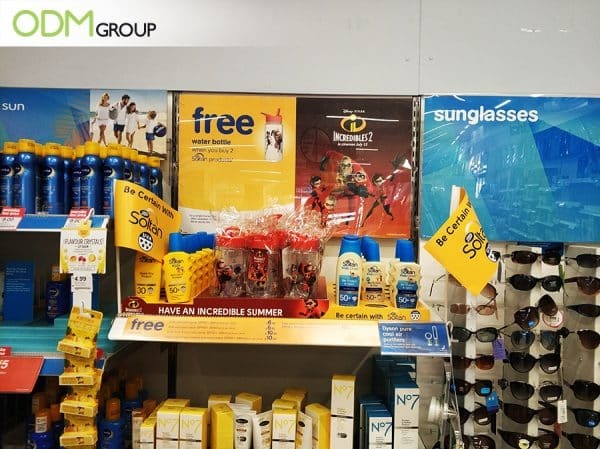 This display is eye-catching and the free water bottle instantly makes it stand out among competitor brands! Think a Customized Plastic Cup could be incredible(!) for your branding?! As you have seen, a custom plastic cup is a cheap but effective way to entice shoppers. Should you need assistance with creating your own cup, please don’t hesitate to speak with us! Whether you need design or manufacturing services, our team can help you out. If you need more examples and ideas, please feel free to browse through our blogs. Customized Sunscreen Lotion bottles. Great for travel companies / hotels looking to give their customers a practical gift while extending their brand exposure. Sunscreen brand Calypso similarly wows customers with practical custom travel bag to carry their product in whilst out in the sun.